Several years ago – four? – I wanted the Kindle. I thought I was the perfect candidate to own a Kindle, to test one out, to let others know if holding an eReader could be as fulfilling as holding a real book in my hands. Was the weight, the feel, the smell really as much of the experience as I believed them to be or could I easily exchange those things for the ease and efficiency of an eReader? And what were the benefits of an eReader anyway? I hadn’t really heard. I never got the Kindle. My wants weren’t high on the priority list back then. Plus, with the beginning of the recession, I was rediscovering library books. Any book I wanted, for free! Just get online, request the titles, wait a few days, and then pick them up in my (practically) personal on-hold shelf area. No more paying for books. No more already-read books piling up in my house. I fell in love with the library all over again. A couple of years ago my sister boxed up and sent me her slightly used Nook Color. She had a laptop, an iPad, an iPod, an iPhone, and, if I recall, some newer, fancier reader. It was kind of her to think of me and I very much appreciated the random gift. I plugged it in, charged it up, and moved about on it a few times and that was it. I just wasn’t sure what to do with it, how or where to get titles. I heard that certain titles were available for a dollar or two. At the time, though, it didn’t make sense to pay for titles that weren’t on my absolute must-read list. It didn’t make sense to pay for any titles, really, when I could borrow books for free at the library. And it didn’t make sense to accumulate books, even if they were electronic, during that period in my life when I was really trying to downsize and simplify. So the Nook Color went unused. I have yet to read a single book on it. But I know that things are changing, that sometime in the future there may not be many physical titles that we hold in our hand, that more and more books are only available electronically. I’ve heard that libraries are spending more on audio books and electronic titles because they cost so much less than actual books. I realize that I need to get with the program, to learn more about electronic readers. I’m fairly technologically savvy in other areas; I need to jump on the eReader bandwagon, too, and not get left behind. I also want to know more about eReaders because, as a writer, I may someday want to publish an electronic version of some of my work. Right now, I can’t even visualize what that might look like, and I know nothing of the process. The first step, it seems, is to start reading ebooks and getting a feel for them and how they are similar or different to traditional books. I read in the paper today that our local library is offering classes on getting started with eReaders. They set the classes up for after Christmas because many people get eReaders for Christmas and don’t know how to get started with them. I also read that the library now has quite a few titles for eReaders. This class is for me. Now is the time. I chose two dates that should work, will work, if I make a concerted effort to get there and nothing else comes up. Both days are in January. I’m looking forward to it. And I’m sure I’ll keep you posted on what I learn. In the meantime, I’ll keep holding my precious books in my hands, carrying them with me, feeling them, breathing them in. I know that sounds kind of strange, but I also know you get what I’m talking about. Do you use an eReader? Which one? And what are your thoughts about eReaders? I also resisted the eReader movement, for the exact same reason: the library. Then it became time to pack every single thing I own, including hundreds of books, into boxes. Now I have a Kindle Fire and I LOVE it. I was never able to really tote around as many books as I wanted during long trips anyway, and this gives me instant gratification if I want to read the next book in a series. It’s not the *same* as a book but there are definite advantages! The only disadvantage is when I’m ready to read and I forgot to “plug in my book.” 🙂 Enjoy! Thank you for the insights, Linnea! I am ready to embrace the notion and learn more. I can see that not having the thing charged up could be a real let-down. iPad. iBooks and Kindle. Still prefer paper, but the iPad is very convenient. So the iPad doubles as an eReader? Works about the same? Think so. If e-reader was the main use, I’d probably go with the iPad mini. Okay. Well, I already have the Nook so I will learn how to use it first and see if I’m going to get much use out of it. Thanks for your comments and insight! My Kindle is great “luxury item” for stowing in my backpack for camping trips when I can’t sleep, it’s dark, and I need something to keep me company. I will talk to you more about what you’ve read on your Kindle. DRY EYES! I HAVE TO USE TECHNOLOGY FOR WORK AND TO KEEP TRACK OF MY FAMILY. JUST GIVE ME AN OLD TIMEY BOOK AND A BOTTLE OF ARTIFICIAL TEARS. Oh, no, that’s what I was afraid of. I love getting off my computer and looking at a book for a change. Darn it – I was hoping that an eReader wouldn’t be as tiring as staring at a real computer screen. Well, that is one major downfall for sure. Thanks for commenting! By the way, who is this? Like I say, I’ve barely turned the thing on but I am really hoping it might be less tiring on the eyes than the computer or my phone. I suppose it’s going to be like most things – balance between the old and the new. I had a Kobo when they first came to Australia and now I have LOTS of books on my iPad, mostly because there’s no bookshop anywhere near Country Town and when I order online the delivery takes a few weeks. I’ve found books to be cheaper at times on the iPad and it’s great for when I go away or am travelling. Ate you able to get most any title you want? Do you pay for best sellers? Yes and I can pre-order books that I want to get and as soon as they’re released I get an email to say the book is ready to download. I pay for most books, but get plenty of cheap ones as well and some free one and pay for others. Oh, so you’re still paying. I’ll have to see what’s available here. It’s not that I don’t think I should have to pay for a book, but I really don’t have to pay to read a book from the library. The library paid for it. Well, thank you so much for your input! Hi, I just read this. I’m a little behind on a few things. 😉 I have a Nook and I love it. It gets sporadic use, depending on what side of the ocean I’m on. When I’m in the U.S., I use it A LOT. Let me tell you some things specific to the Nook. 1) if you have a Barnes and Noble store near you, you can read your Nook there for an hour ever day, free of charge. So you can search the books, download what you want, read for an hour, and then come back another day to read more. I’ve read entire books that way. Good excuse to hang out, read, and have coffee. Can’t go wrong. 2) Nook has a page on Facebook, and they have Free Fridays, which means each Friday, they post a book that you can then go to the website and order with no charge. Some people like to complain about the books they offer, but for free, it has allowed me to check out some writers I might not otherwise have read. 3) There are many free and low cost books that you can read on them, but for best sellers and many other things, the library is still the only free way to access. Still, for the things I would buy anyway, I love the Nook, especially when I fly. I can have a virtually endless supply of reading material for little weight. Some general things about e-readers, particularly after seeing some of the other comments. Most important (for me anyway) is that the Nook is not backlit. Therefore, it is NOT like a computer scream. It’s like reading a page of anything else. You have to have a light source in order to read. For this reason, I don’t like the “nightlight” things that some people like to use because I don’t like the light in front of me. So I’ve never had a problem with eyestrain of any kind. My Nook will never replace the delight of having a physical book, but as a device that allows me to transport large volumes of reading material, it can’t be beat. Let me know if you have other questions. I’d be happy to give you more information. Deborah, you are just amazing. This is all such valuable information. You should copy it and use it to write your own post. Nook would probably pay you for the product review. We do have a Barnes and Noble in town and I wouldn’t mind spending more time there, especially on hot summer afternoons when I am not teaching. Good news about the light concern. 1. 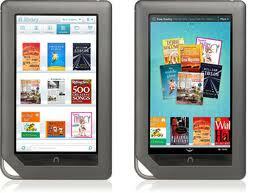 If you want to read a top seller on your eReader, are they always available to purchase? And what would you say the cost is, about a third the cost of a regular book? 2. Have you tried running on a treadmill and reading your Nook at the same time? That would be the ultimate for me, my dream come true, if I could coordinate that. 3. Is there a way to just listen to the books you download or is that a separate type of book altogether (electronic book vs. audio book)? Can’t wait to learn more. Once again, thank you for the time you put into this! 1. If it’s a best seller, the publisher is usually eager to put it into various e-formats. The cost is still about 3/4 the price of a print book, unless it’s a special promotion. The intellectual property is still being paid for, just the paper and ink that’s not. But like I say, there is the lending function. I’d have to look into it more to see if it works for best-sellers. Next time I’m in my library online, I’ll check and see which of my books are lendable. 2. I’ve never tried running on a treadmill with mine. However, if you have a treadmill that has something to hold it secure, I’m sure you could. Turning pages is just the touch of a finger to the right of the screen. I had a black and white nook. The thing froze up a ton of times and then I returned it because it appeared to be a lemon. They gave me a new one and that one froze all the time and wouldn’t get the net at home. Got the color nook. Well both nooks are still frozen. So I can’t say I would recommend the nook at all. So have the kindle’s frozen up or not? Weird! I actually have a Nook Color that was given to me. I’ll find out soon if it freezes or has other issues. Thanks for your feedback. Oh, I gave up with the original nook. The screen has been frozen now for about a year. I’m tired of taking the battery out to unfreeze it. You shouldn’t have to do that with an e -reader. Nook is an “ereader” , not all “ereaders ” are nooks. There is Kindle and some other brand names, many different brand names and possibly one brand name might be better than another. I bought a nook color for my mother a few years ago and she uses still. I’m going to look for you on Facebook. And I’ll keep you posted on what I learn about the Nook and how to use it. Thanks for the clue on the fox. I saw four Todd Cranmers and was going to ask you which one.